If you’re like many exercisers out there, you may have a “problem area” that repeatedly gives you issues, annoyingly interrupting your training routine. This could be your lower back, your knee, your shoulder, your ankle…the list goes on and on. You’re not sure why, but the tension and pain subsides for a while, so you resume your training routine, and BAM, you’re in the middle of another flare-up before you know it. The worst part is that these types of injuries tend to get worse with each occurrence. The reason behind these annoying repetitive injuries is termed the Cumulative Injury Cycle. It’s a vicious circle that reinforces itself with each repetition. If you fail to recognize the warning signs, you may eventually face a much more serious injury. The way to break the cycle is through corrective flexibility training, which you can work on yourself or enlist the help of a trainer, chiropractor, physician, or other professional. 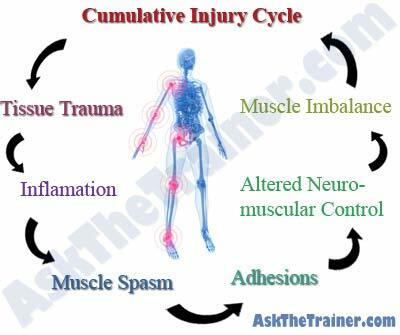 Read on to learn how the Cumulative Injury Cycle works and how you can break it.